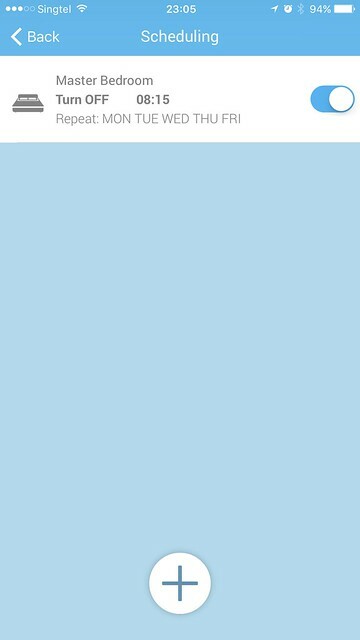 Sensibo Sky  is retailing for US$119 (S$169) and shipping to Singapore is an additional US$7.88 (S$12) for normal international shipping (via SingPost) or US$17.33 (S$25) for express international shipping. 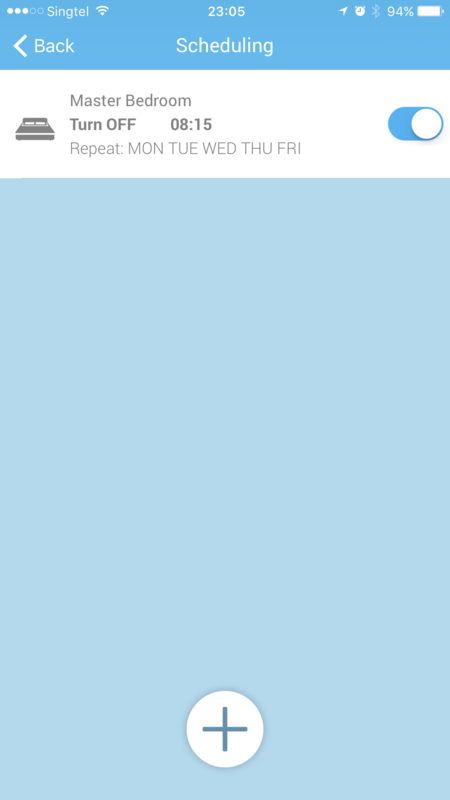 Shipping is free if you are buying more two or more Sensibo Sky. 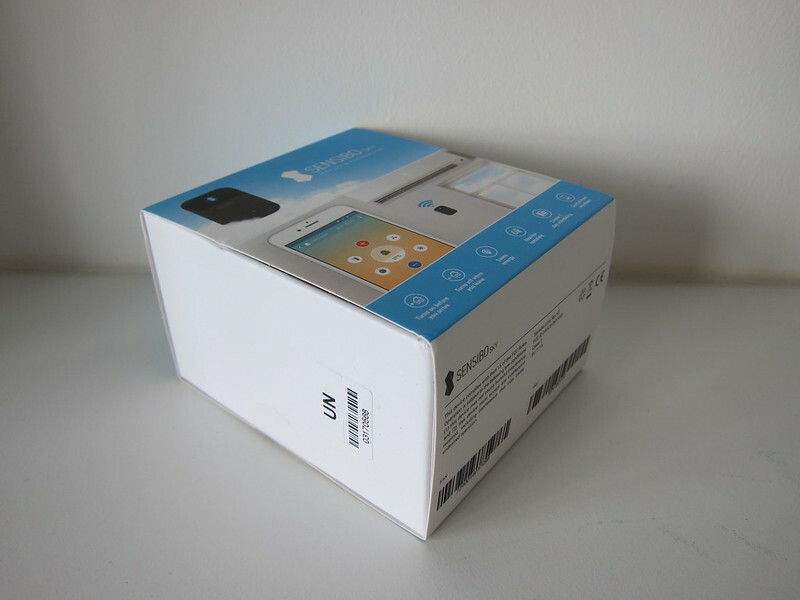 A pack of two Sensibo Sky retails for US$238 (S$338), a pack of three retails for US$297 (S$422), and a pack of four retails for US$396 (S$562). 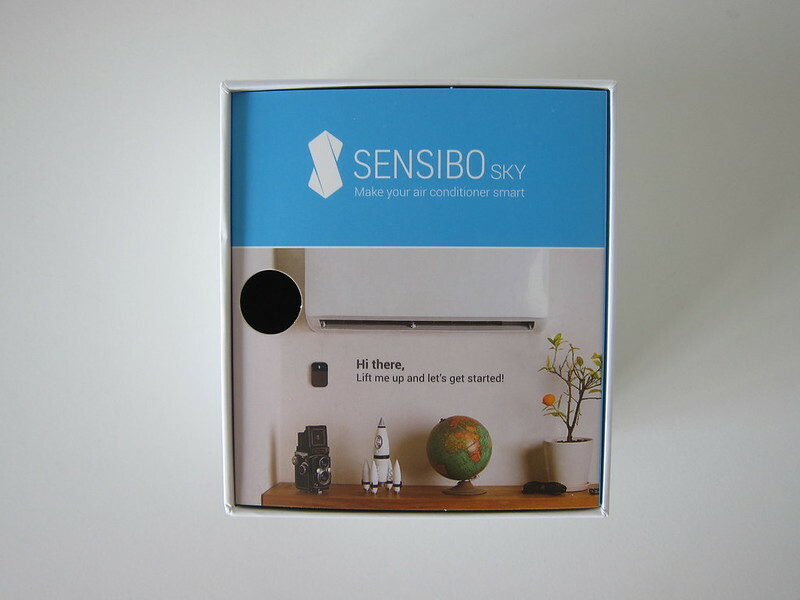 Sensibo Sky is the second generation smart air conditioner controller from Sensibo. 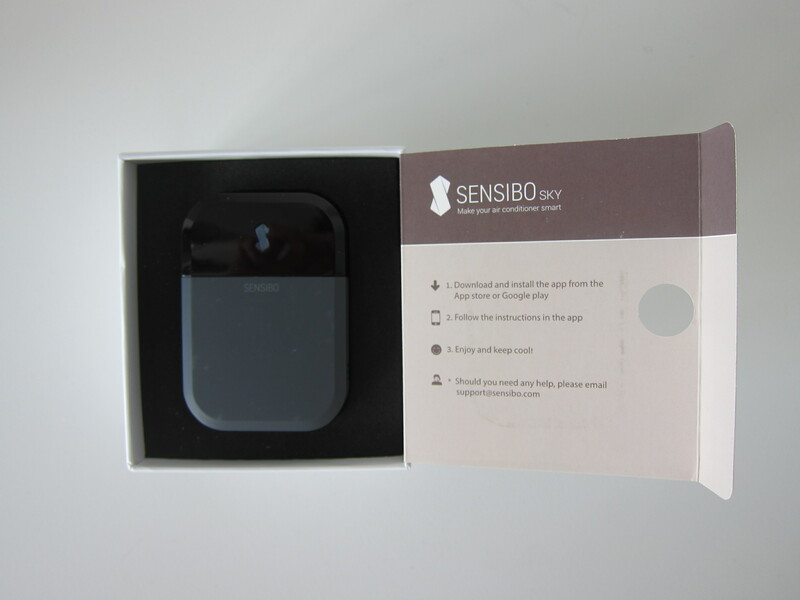 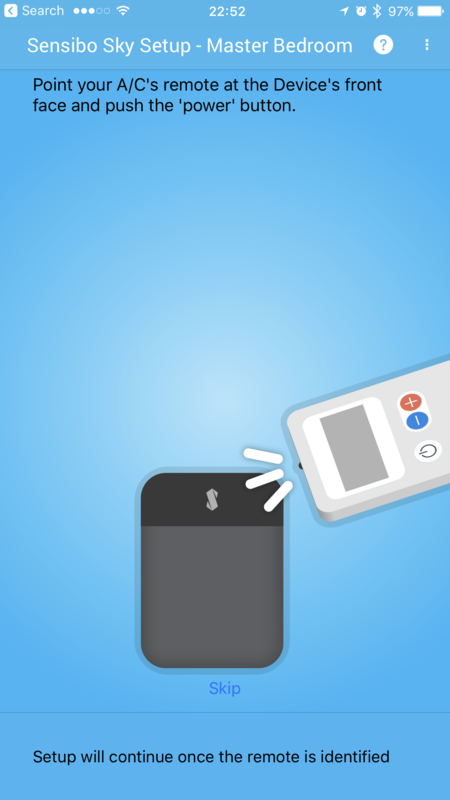 I heard of Sensibo before as I have reviewed similar products like the Ambi Climate  and tado . 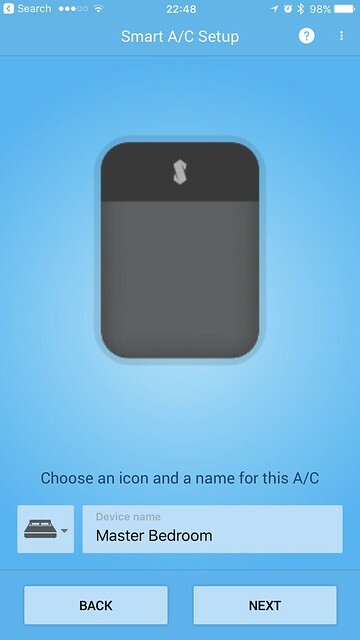 I am not impressed with the first generation Sensibo smart air conditioner controller. 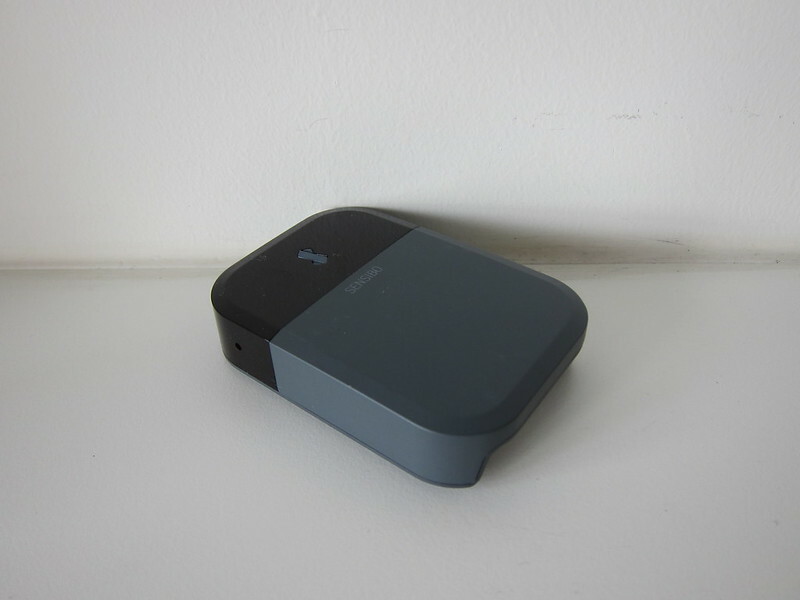 It is clunky because it comes with two units, a smart pod which you are supposed to place on your air conditioner and a hub which is connected to your wi-fi. 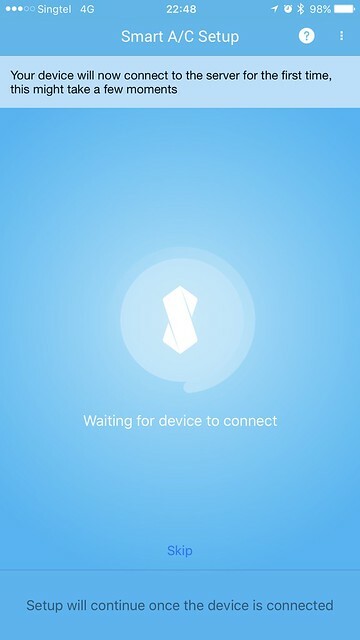 With Sensibo Sky, everything is in a single unit connected to Sensibo’s cloud (I am pretty sure the word “sky” is derived from it). This is something Ambi Climate and tado have been doing all along. 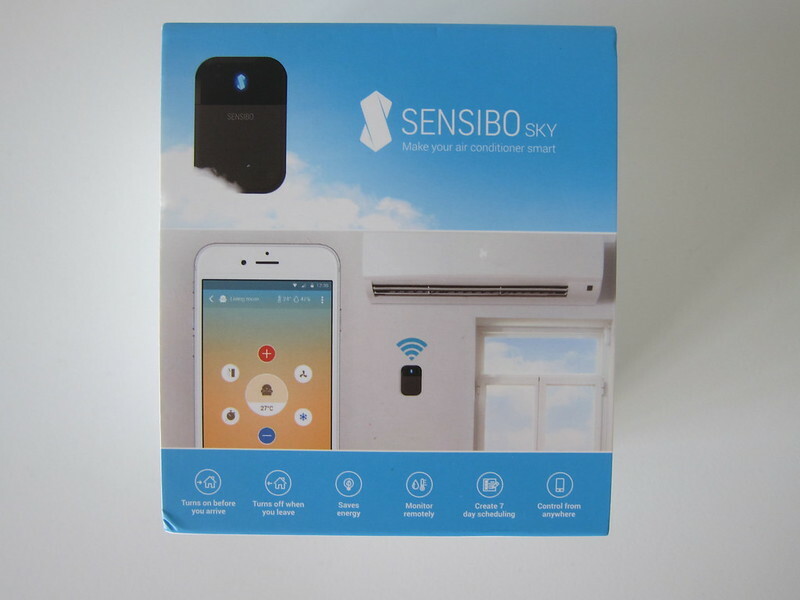 Sensibo Sky supports almost any air conditioner that has a remote control. 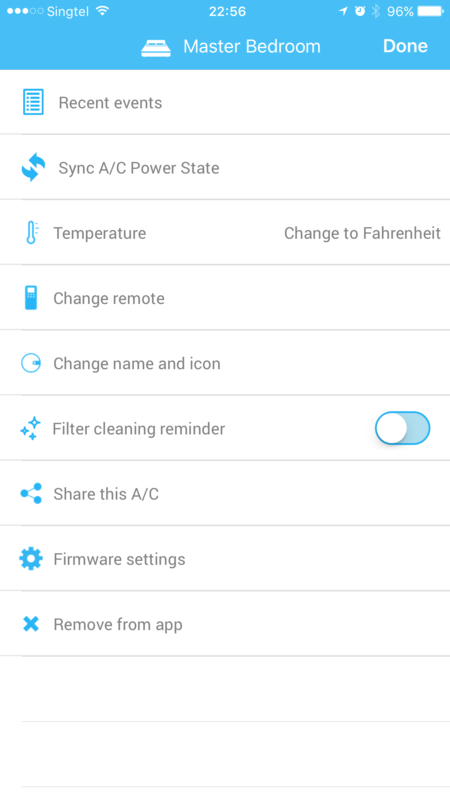 You can check if your air conditioner brand is supported here . 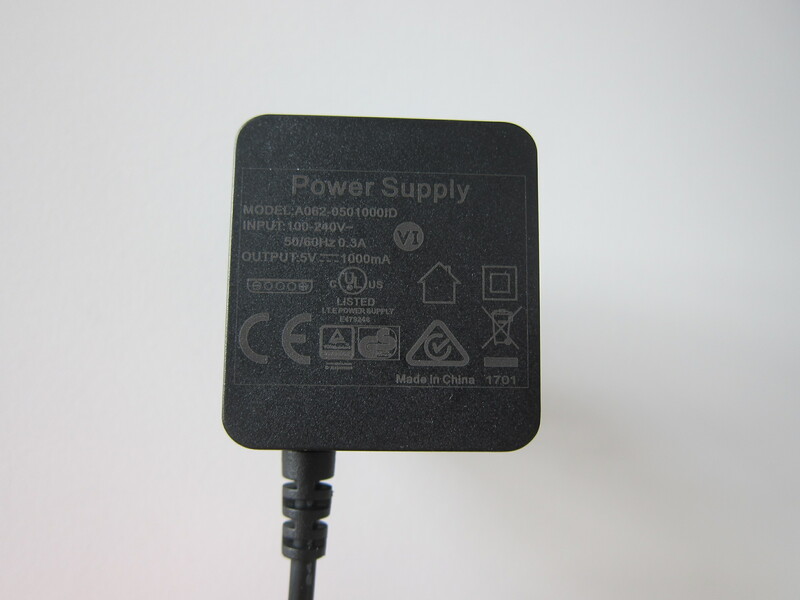 It is powered using a micro-USB cable, but the cable is fixed to the adapter. 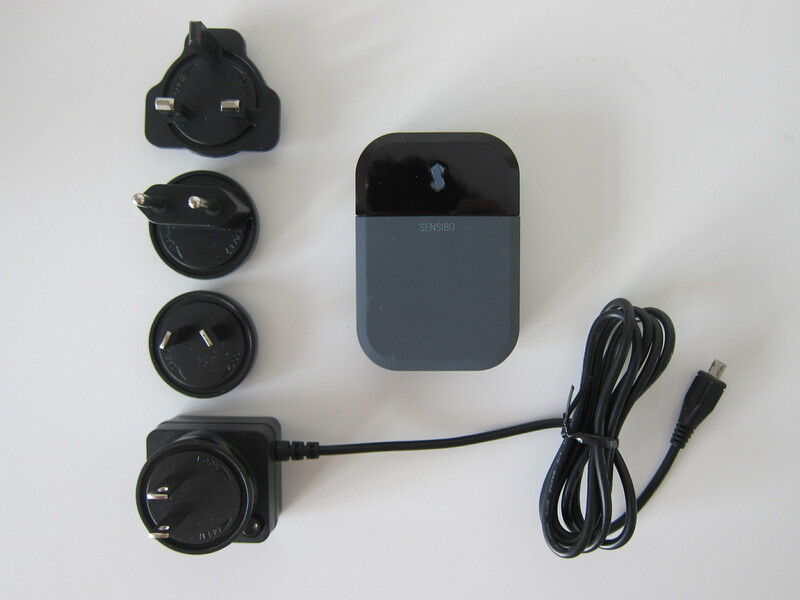 I ended up not using the included power adapter as I already have a USB charger near my air conditioner. 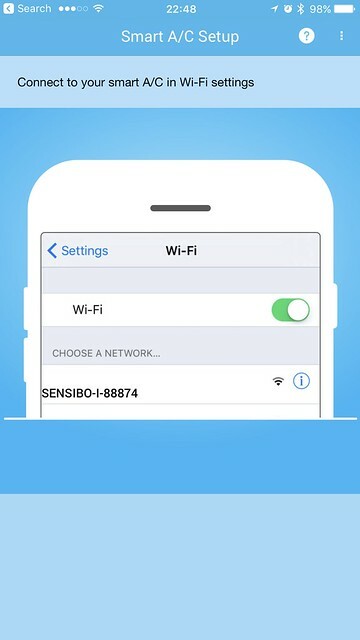 To start the setup, you can download the Sensibo iOS app  from App Store or Android app  from Google Play. 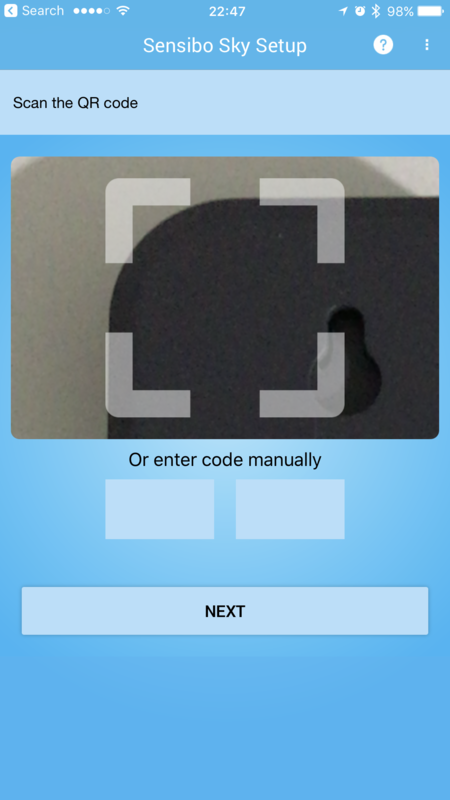 The setup process is straightforward and fast. 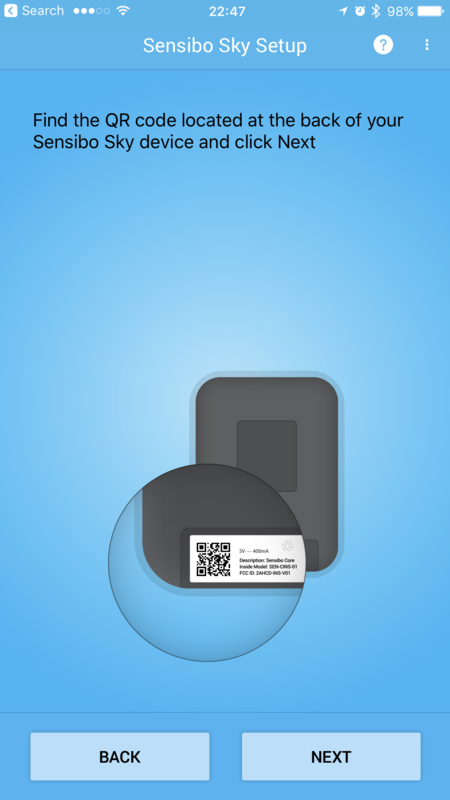 Probably the fastest if you compared it with Ambi Climate and tado. 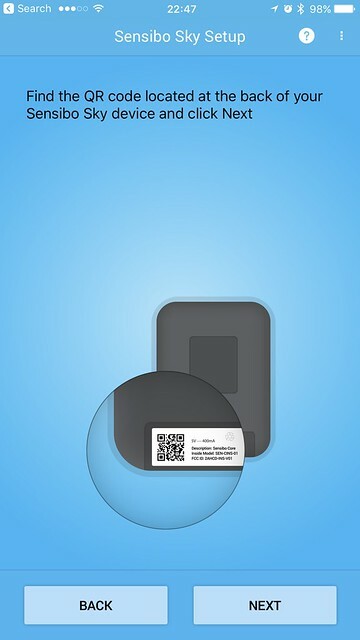 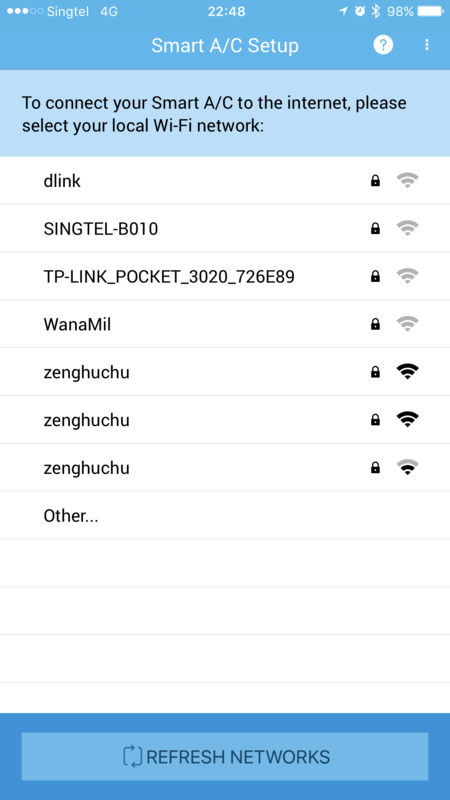 You scan the QR code on Sensibo Sky, connect to the wi-fi network that is being created by Sensibo Sky and use it to connect to your home’s wi-fi network. 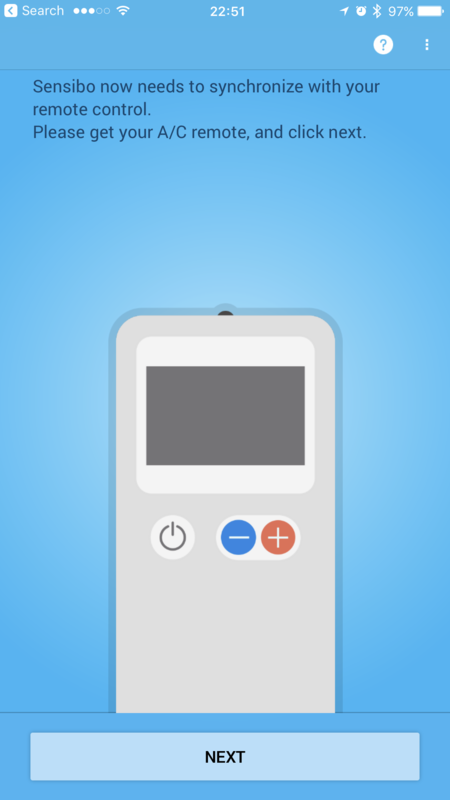 Once that is done, you just have to point your air conditioner remote control to Sensibo Sky and press the power button on the remote control. 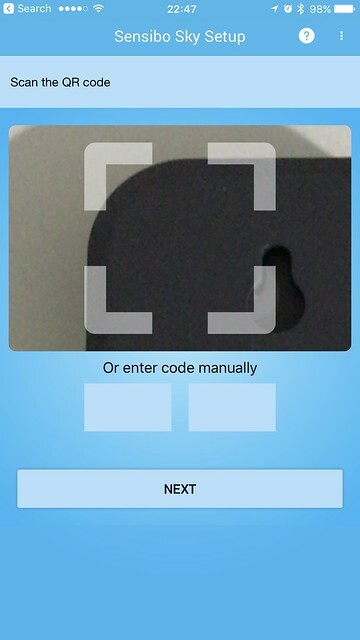 That is all it takes for Sensibo Sky to detect the correct Infrared (IR) signal to use for your air conditioner. 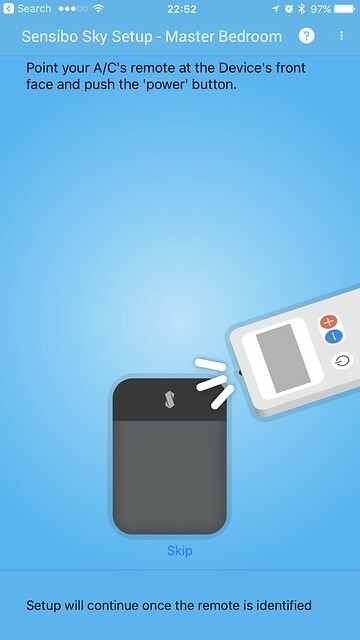 It is a smooth process, unlike tado where you have to go through so many tests before it can detect your air conditioner correctly. 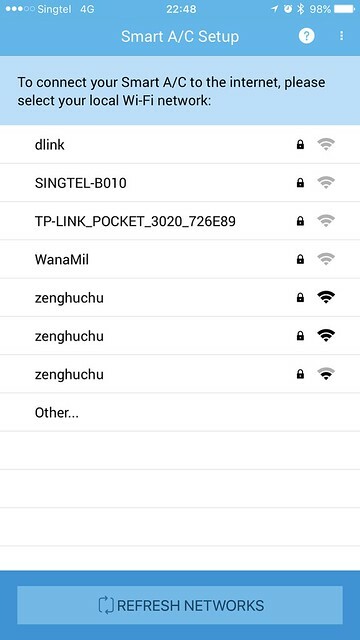 It is even faster than choosing your remote control model which Ambi Climate uses. 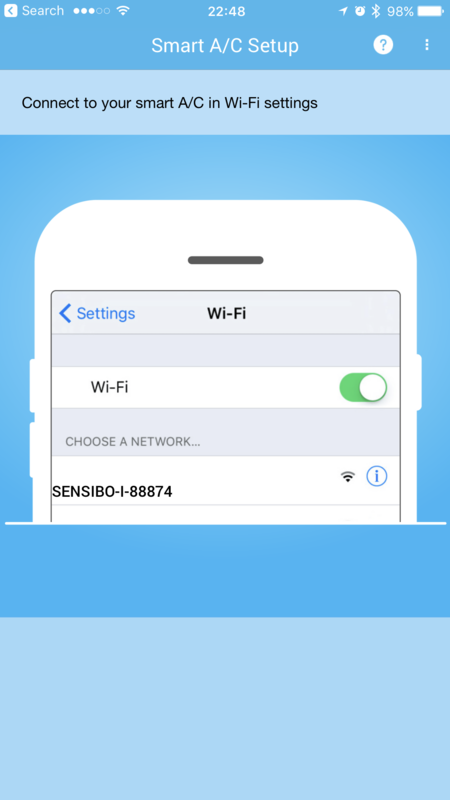 Once you have setup Sensibo Sky using the app, you can access and control your Sensibo Sky remotely using a browser  as well. 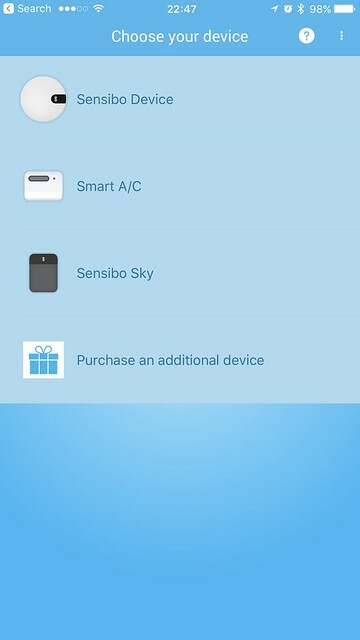 Sensibo Sky’s features are what you will expect out of a smart home device. 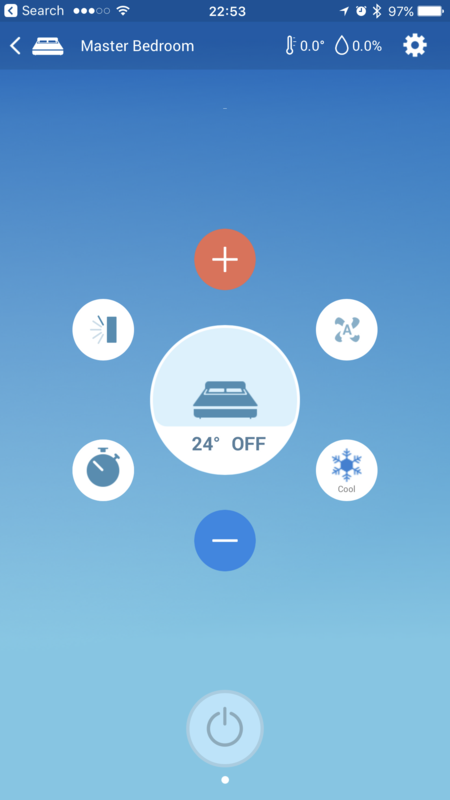 It allows you to control your air conditioner remotely as well as creating schedules so that you can choose when to turn on or off your air conditioner. 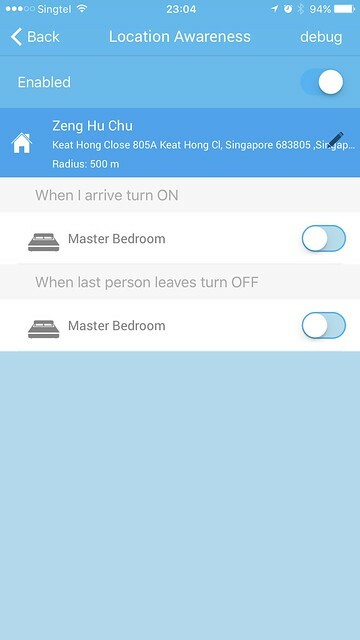 It has geofencing (known as Location Awareness in the app) so that you can use it to turn on or off your air conditioner when you are arriving or leaving home. 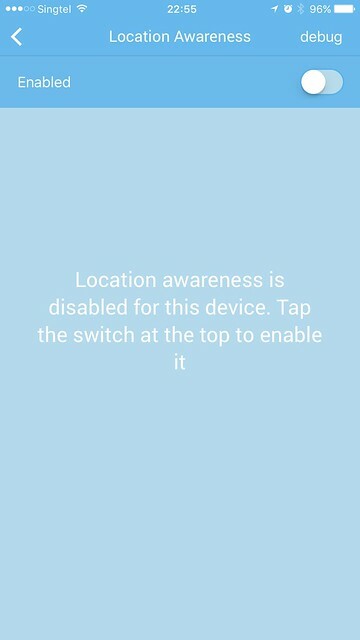 By default, it is disabled. 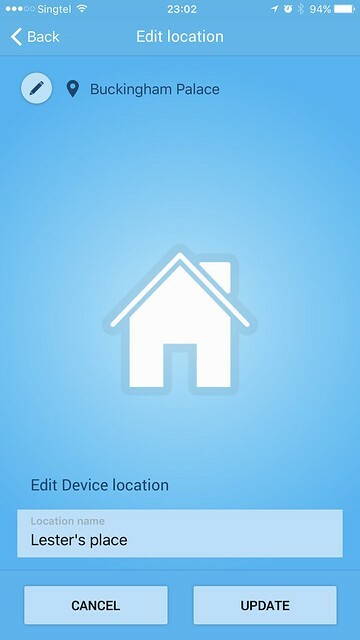 You need to enable it by tapping on the map pin icon at the top, and it will prompt you to mark your house’s location. Once that is done, you can drag up your air conditioner to the location as shown in the screenshot below. 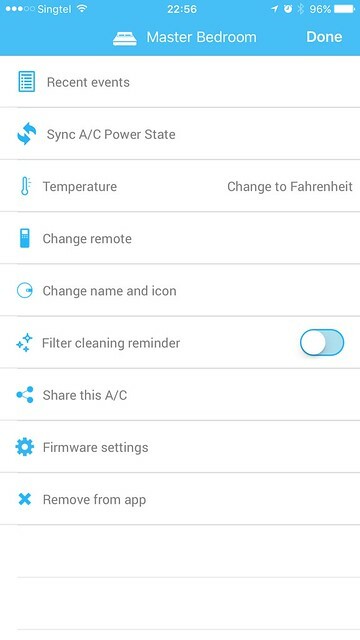 You can check the time you turn on, turn off or change the temperature of your air conditioner in the recent events settings. 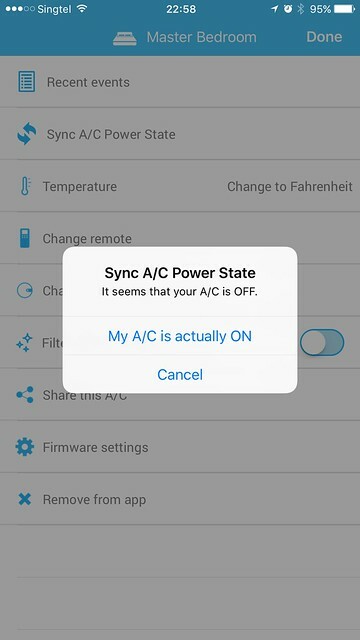 There is an interesting feature called “Sync A/C Power State” which allows you to indicate the power state of your air conditioner if it happens to be out of sync with the app. 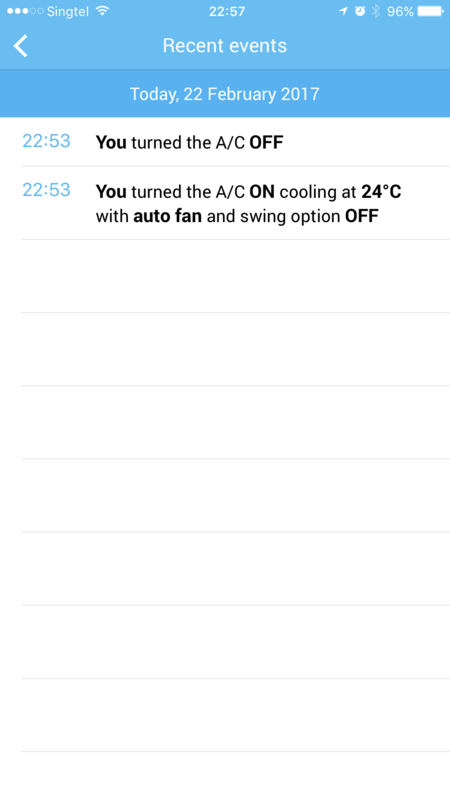 So far this is the only smart air conditioner controller device that has such a feature. 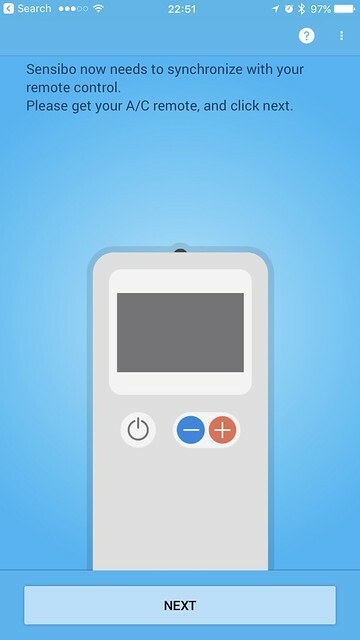 Sometimes you might use your physical remote to control your air conditioner, and I am surprised that Sensibo Sky will intercept that and update the app accordingly to show the correct power state. 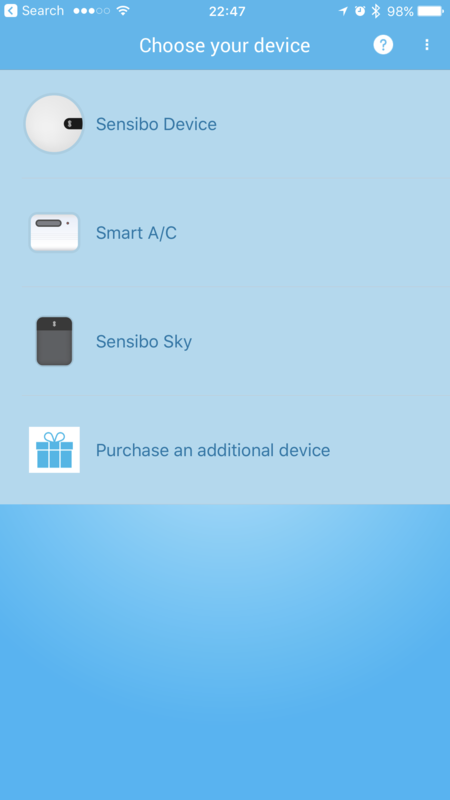 Again, Sensibo Sky is the only device that does that as when I use Ambi Climate or tado, the power state of my air conditioner will be out of sync if I use a physical remote. 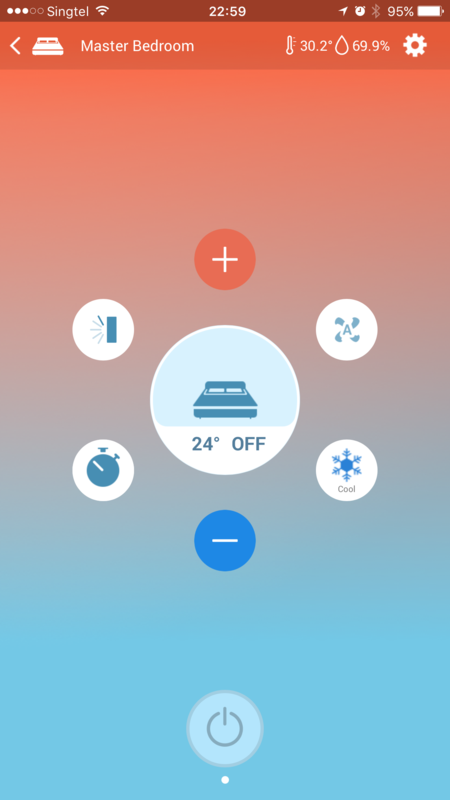 Besides scheduling, you can also set your air conditioner to turn on after X minutes. 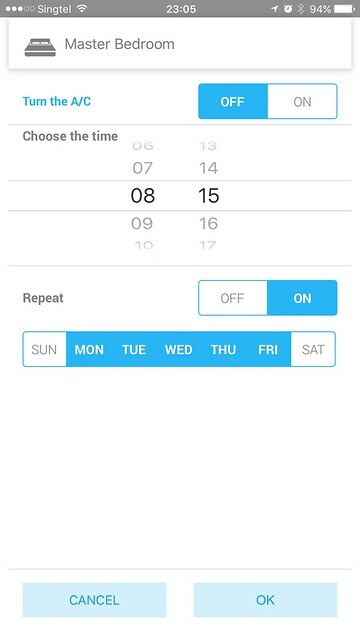 Personally, I don’t find this feature useful. 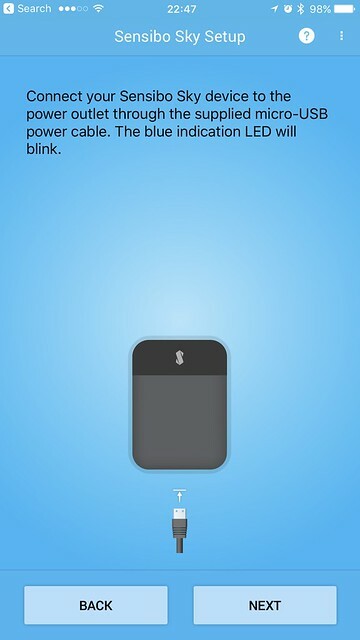 Sensibo Sky supports IFTTT  and Amazon Echo . It also has an open API  that you can use for your smart home project if you need it. Sensibo Sky integrates natively to Amazon Echo using Amazon Alexa Skills. 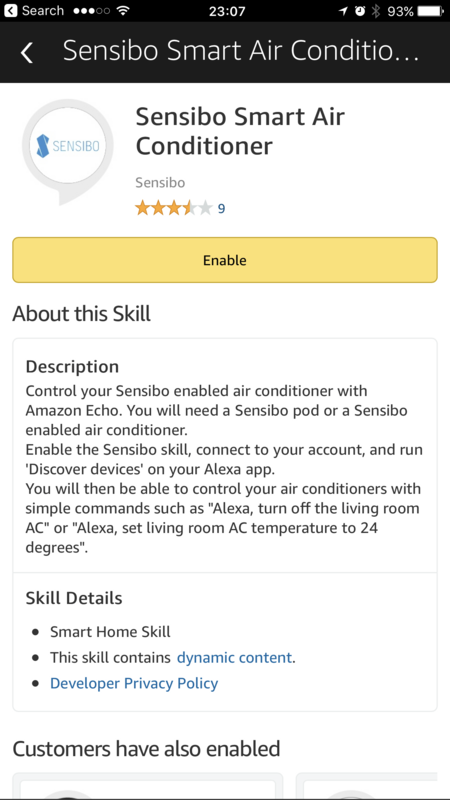 Just search for “Sensibo” and install the skill on your Alexa app. 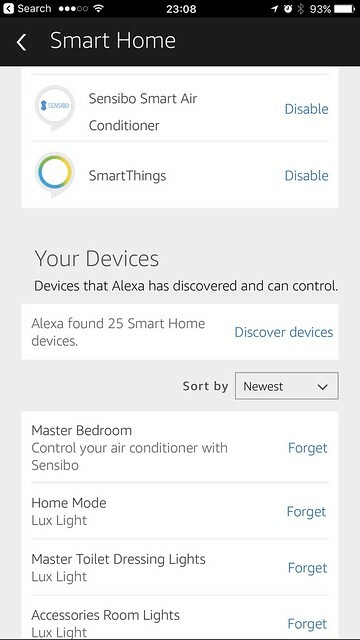 After doing that, the Alexa app will prompt you to discover your smart home devices and your air conditioner name should appear in the Smart Home > Your Devices screen. 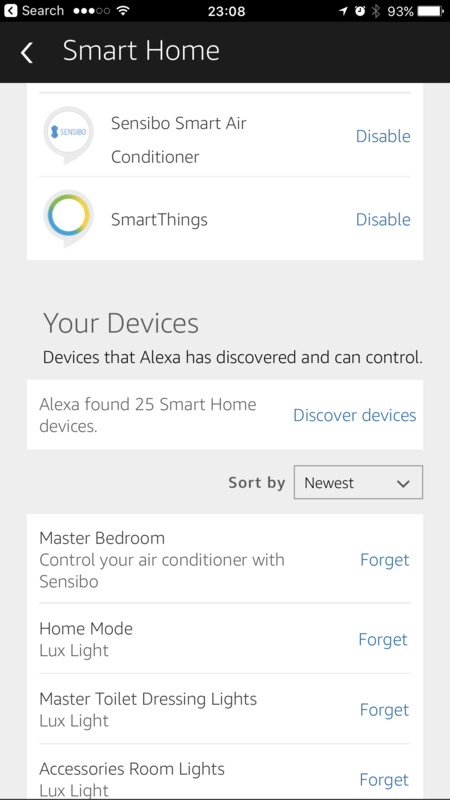 I named my air conditioner “Master Bedroom” on the Sensibo app, so I have to say “Alexa, turn on Master Bedroom” which sounded weird. 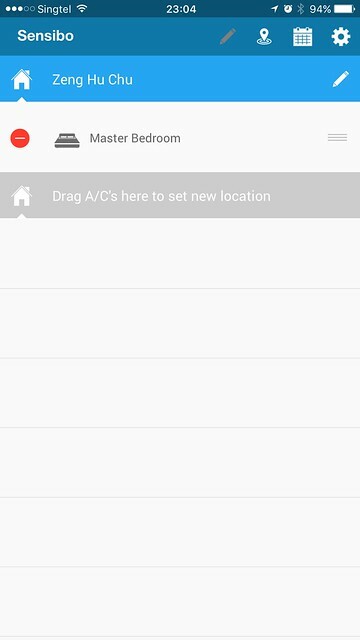 I recommend suffixing your air conditioner name with “air con” or you can be like me and create a device group called “Master Bedroom Air Con” in the Alexa app and move the “Master Bedroom” device inside it. 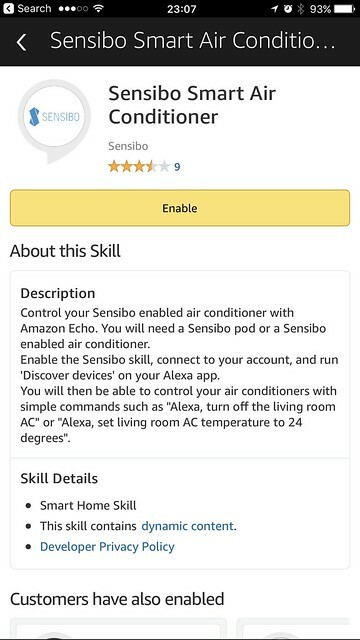 Once that is done, you can say “Alexa, turn on Master Bedroom Air Con”, and it will sound more natural. 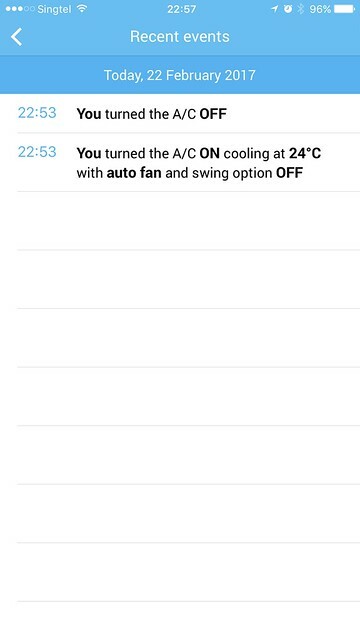 To set your air conditioner to an absolute temperature using Alexa, you can say, “Alexa, set Master Bedroom Air Con to 24°”. 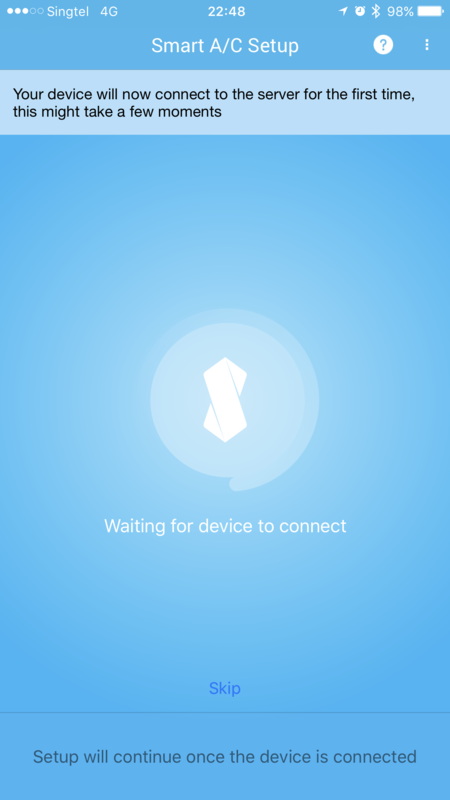 I have not found a use of IFTTT yet since the Sensibo app itself supports geofencing. 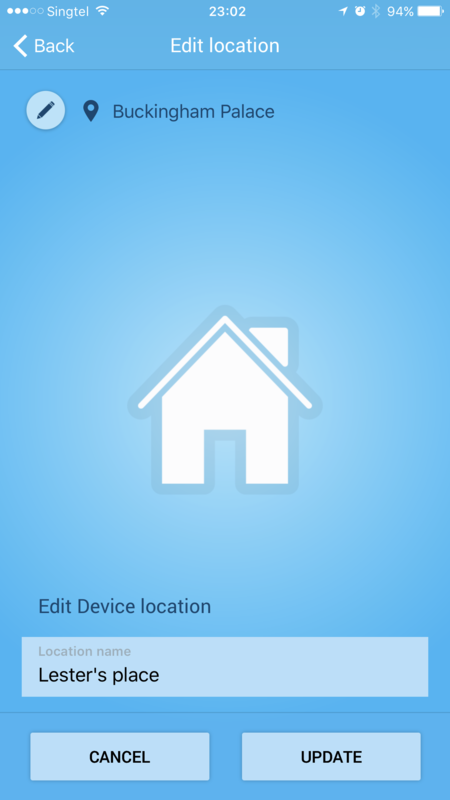 Geofencing is my main reason for using IFTTT because not every smart home app supports it. I think Sensibo Sky is a good smart air conditioner controller that is priced reasonably at US$119 (it sometimes drop to US$99). 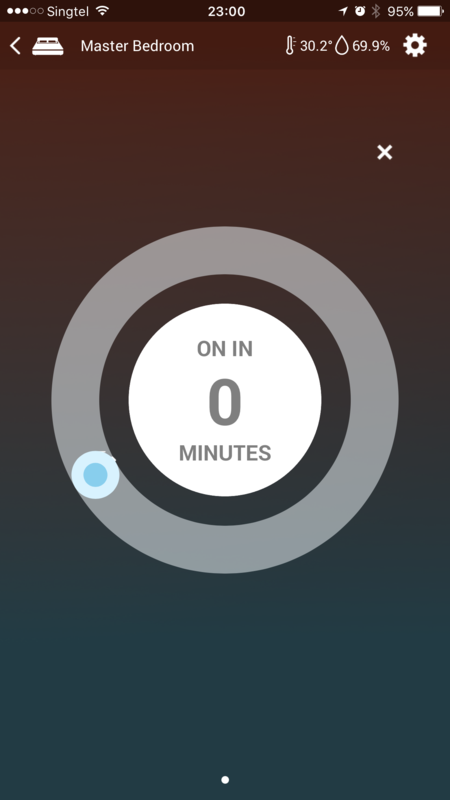 Having native integration with Amazon Echo reduces the need to rely on IFTTT, and that is a plus point. 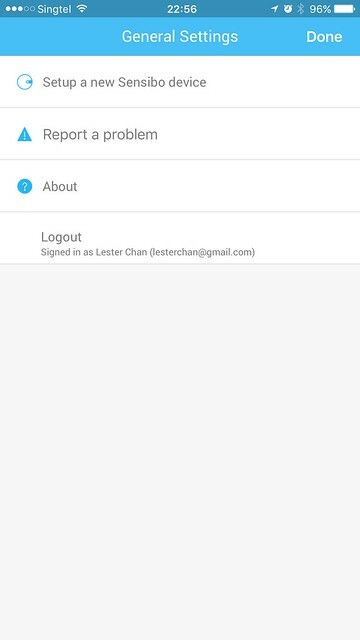 You can even integrate it with your smart home system using the open API. 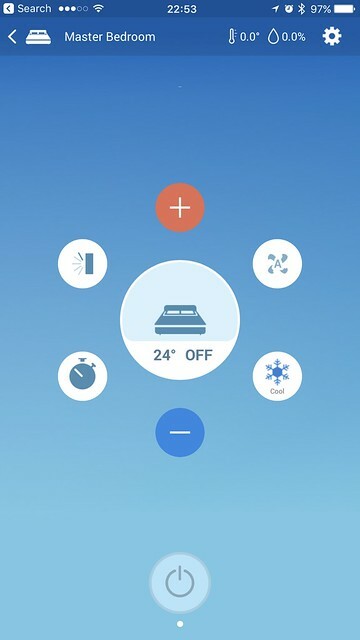 Besides using the Sensibo app or Amazon Echo to turn on or off your air conditioner, you can also use the physical air conditioner remote control. 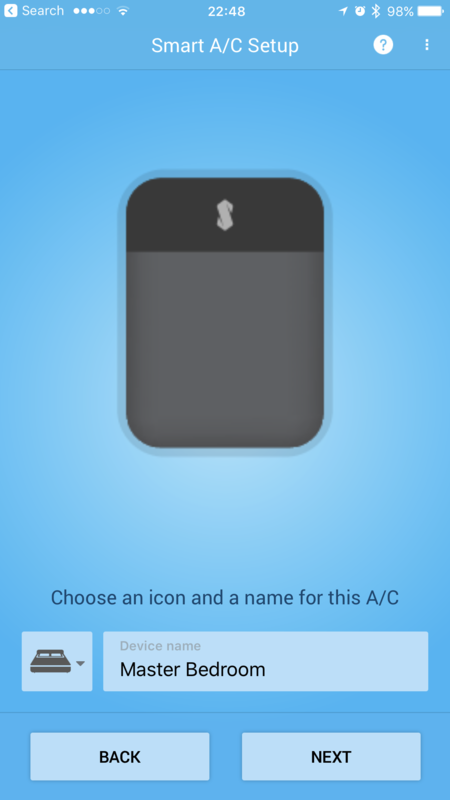 Sensibo Sky will intercept the IR signal from the remote control and will update the app to show the correct state of your air conditioner. 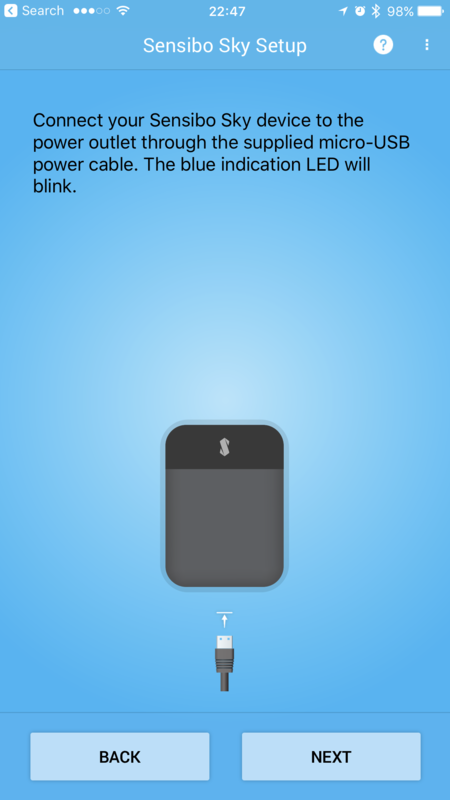 This is possibly my favorite feature of the Sensibo Sky. 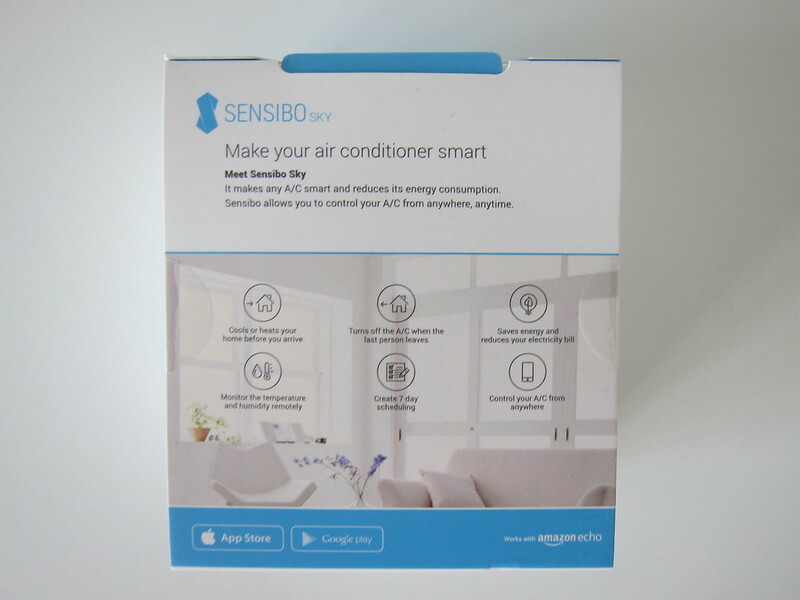 If you don’t need to climate control your room which is what Ambi Climate does, Sensibo Sky will be a better alternative than tado for you.